We grew up in Bozeman, Montana when we still could (and did) ride our single-speed Schwinn bicycles into grizzly country. We grew up outdoors – and loved it. We hiked the mountains, swam in the rivers, fished, slept out in leaky tents and cheap sleeping bags in the forest, and drove gravel and dirt roads full of mud holes, packed with snow, and sometimes we got stuck – really stuck. We learned lessons about how not to get stuck. Nature is in our DNA. During the course of our lives, we’ve also spent a lot of time in big cities; we both lived in Europe, and we developed a great appreciation for literature, the visual arts, and the buzz of city living.We knew each other in high school; both graduated from Montana State University (we’re Bobcats), and then went our separate ways for forty years before reconnecting. Now we live in South Dakota (mostly by default) and use it as a centrally located base for travel. 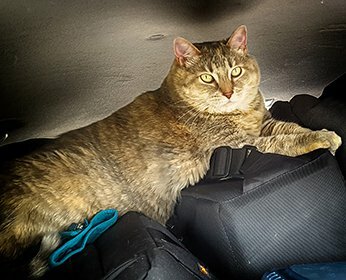 Our pet kitty, Sassy, joined our little “traveling band” four years ago, and with her potty box and food dishes behind the front seats, settles in quickly on the console between us as we find off-the-beaten path gravel and dirt roads, or drive through cities and the countryside. She’s a trooper. Before Sassy, we had another pet kitty named Leesha, who logged 20,000 miles with us before she crossed the Rainbow Bridge. Louise spent her career as a librarian, running base libraries in the Air Force. 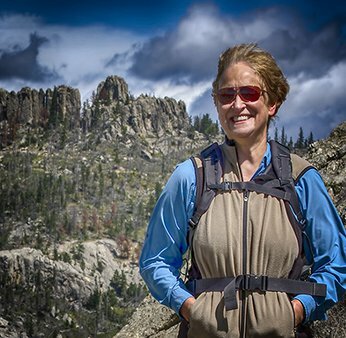 She does a lot of the heavy-lifting research that shows up on our website in the form of geologic, flora/fauna, and geographic information. She’s a Master Gardener specializing in native plants, a botanist, and has a great eye for spotting a photograph or an unusual plant. She lived in Germany while her late husband was in the Air Force, and traveled all over Europe. She also lived in California and Texas, and spent a lot of time in San Francisco taking in the art scene. Louise has a master’s degree in Library Science. 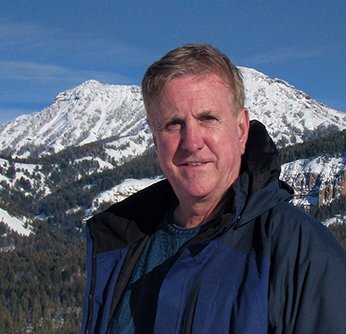 Brian spent his early career with the US Forest Service while working his way through college, on fire-fighting hot shot crews, as a Helitack foreman, as a trail crew foreman in the Absaroka/Beartooth Wilderness along the entire northern border of Yellowstone National Park and as a Public Information Officer. Later Brian went into high tech and ran his own consulting firm for over twenty years with offices in Seattle, San Francisco, and New York City, working with a number of “name brand” high-tech companies and the venture capital firms who invest in high-tech startups. Brian has a Master’s Degree in Creative Writing, and an MBA in Engineering and Technology Management – but his passion has always been photography and writing. The feline member of our team, Sassy, came to us as a “Can you babysit her for a while?” and elected to stay. She looks like (and weighs as much as) a bobcat, (although she didn’t graduate from Montana State) and has a wild streak that has taken a bit of taming. Now she’s loving and loyal, and travels with us with a sense of safety and confidence that we find touching. She even condescends to walk on her leash on occasion, and unloads and reloads herself into the rig as necessary.